Larrakeyah Primary School graduate, Zhuang Zhuang Sun,has received the Administrator’s Award for Territory Primary Years Scholar, fulfilling the criteria of academic achievement, outstanding behaviour, and outstanding citizenship and concern for others. “Primary school was pretty easy for me – it was usually As and Bs on my report card,” he said. Zhuang Zhuang said the award was a surprise but he was proud to receive it. The top performer said Larrakeyah Primary School staff had been a strong influence on his education. “My teachers, and everyone at Larrakeyah, were all excellent,” he said. Crediting science as his favourite subject, Zhuang Zhuang has cited engineering as a future career. But his favourite part of primary school was being able to use the new Year 6 classrooms. “We nearly missed out, they opened in Term 2 of Year 6,” he said. 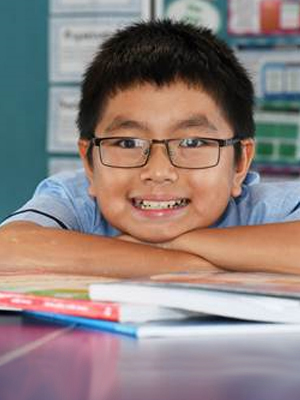 With two weeks under his belt at The Essington School, Zhuang Zhuang says the amount of homework has been a surprise. “We didn’t get any homework at Larrakeyah – I get a lot less free time,” he said. At Larrakeyah Primary School, the former Year 6 student achieved the highest score in the 2017 Cambridge Primary Checkpoint Exam in English.